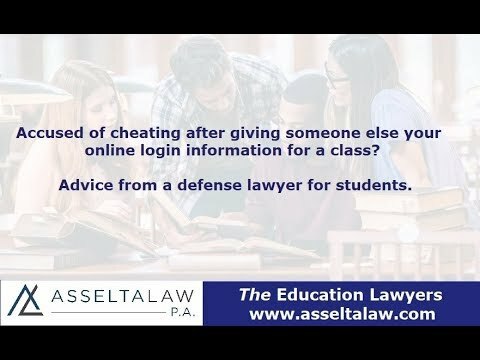 Accused of cheating after sharing your university login info? Defense Tips. Most colleges and universities utilize an online portal. Students can logon to check their grades, get your syllabus, submit assignments, and take tests. What happens if a student gives someone else the login information for their school account? You can be accused of cheating. Schools keep a log of each time your online profile is accessed and what was clicked. Not only is the date and time recorded, but the IP address of your computer too. This means that if a friend or tutor that does not live in your area accesses your online account, the school can flag this as an irregularity. What if I was working with a tutor and they wanted to see my assignments? Whether the school accepts this argument depends on your student handbook. Saying you gave access to a tutor or friend may still not help you avoid a disciplinary sanction. The university could view this help as unauthorized collaboration. I didn’t know that sharing my online class login was a violation of the university code of conduct. Can I fight the academic integrity charge? Yes. There are always arguments and defenses to be raised to fight an honor code violation like unauthorized assistance or cheating. Can you help me fight a code of conduct charge in school? Yes. I assist students all over the United States facing disciplinary issues. I offer help from initial meeting and investigation preparation, to drafting academic committee hearing defense arguments and witness questions. I also write student appeals if found responsible. Richard Asselta is an award-winning student defense lawyer who offers services throughout the United States. He has extensive experience in defending all types of college disciplinary issues.